EAST LANSING, MI--(Marketwired - Jan 25, 2017) - Michigan State University fans might bleed green and white, but they'll be seeing orange when Blaze Fast-Fire'd Pizza, the nation's leading fast-casual pizza concept, opens its doors in the spring. Blaze Pizza announced today plans to open an East Lansing, Michigan location, on Michigan State University's campus, at 437 E. Grand River Ave. The new artisanal pizza concept will be located in the State News building. 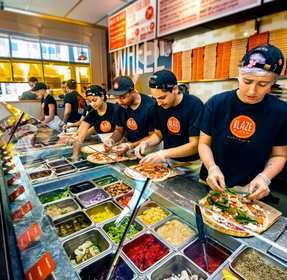 Blaze Pizza is a modern day "pizza joint" that has been cultivating fanatics since it opened its first location in 2012. Each restaurant features an interactive open-kitchen format that allows guests to customize one of the menu's signature pizzas or create their own, choosing from a wide selection of carefully sourced, high-quality ingredients -- all for around $8. The generously-sized personal pizzas are then sent to a blazing hot open-flame oven -- the centerpiece of the restaurant -- where dedicated pizzasmiths ensure that the thin-crust pies are fast-fire'd and ready to eat in just 180 seconds. The concept, known for its custom-built pizzas, freshly made salads, blood orange lemonade and s'more pies, has seven other locations in the Wolverine State including one in Lansing located in the Frandor Shopping Center at 300 N. Clippert St. The other Michigan locations are in Kalamazoo, Royal Oak, Allen Park, Novi and two locations are in Ann Arbor. The Michigan Blaze Pizzas are operated by Blaze Midwest Inc. which continues to develop the concept throughout the state. "Blaze Pizza is a perfect choice for college students looking for a delicious, custom pizza at an affordable price," said Rodney Walker, Owner and President of Blaze Midwest, Inc. "At Blaze, guests can create, connect and enjoy pizza at a price that won't break a college budget." Blaze Pizza's authenticity, coupled with its focus on the happiness and satisfaction of every individual guest and team member, has been fundamental to the concept's popularity and expansion in the Michigan area and beyond. The East Lansing location, driven by the brand's commitment to "Intelligent Choices for Our Pizzas, People & Planet," is being constructed with recycled and sustainable materials, will use eco-friendly packaging and feature energy-efficient LED lighting. The new 3,200 square foot restaurant will include over 80 seats. Award-winning design architect Ana Henton is adding several special touches to the restaurant, including an oversized wall mural custom-designed to suit the space. Blaze Midwest Inc. looks forward to growing strong roots within the community. To that end, the company has developed a turn-key in-restaurant fundraiser program that returns 20 percent of an event's proceeds back to local organizations. Blaze Pizza will partner with local schools, sports clubs and other groups to host fundraising events at the new restaurant. For more information, please visit www.blazepizza.com/fundraising. Operating under the umbrella of Northland Investments, Blaze Midwest, Inc. and its sister companies Mariane, Inc., Bells & Birds, Inc. and OC Michigan, Inc. own and operate a total of 13 fast casual, 49 quick serve and 4 casual dining restaurants spanning four states, including Michigan, Indiana, Kentucky and Ohio. Formed in 1987, Northland Investments collective has nearly 1,800 team members currently employed at its various locations. The first Blaze Pizza® restaurant opened on Aug. 6, 2012, in Irvine, Calif., and quickly gained attention for its chef-driven recipes, thoughtful interior design and a service culture that celebrates individuality. Now ranked as the leading fast-casual pizza chain in the Technomic Top 500 Chain Restaurant Report, Blaze Pizza is building momentum and developing a cult-like following as it expands across the country. The company currently operates 153 restaurants in 32 states and Canada, including the major metropolitan areas of Los Angeles, New York, Chicago, San Francisco, Toronto, Dallas, Las Vegas and Boston. Founded by Elise and Rick Wetzel (co-founder of Wetzel's Pretzels), the concept is backed by investors including LeBron James, Maria Shriver, Patrick Schwarzenegger, Boston Red Sox co-owner Tom Werner and movie producer John Davis. For more information, please visit blazepizza.com and facebook.com/blazepizza or click here to view a company video.